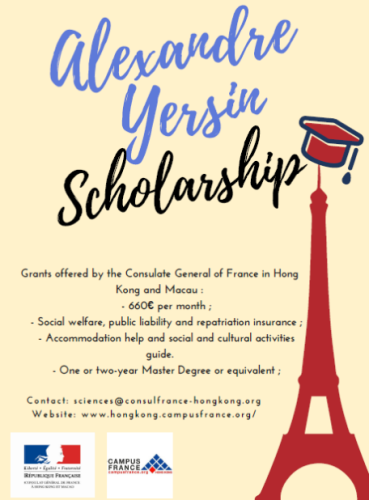 The Consulate General of France in Hong Kong and Macau is offering the scholarships for Hong Kong, Macau students and International Students to study in France. The Department of Education, French Language and Literature in the Consulate General of France in Hong Kong and Macau follows up the school affairs for distant or local French-speaking youth, develops exchanges and ensures the quality of French language courses offered at schools, universities and adult classes in Hong Kong. It promotes French and French-speaking books by different means, in particular through conferences and debates. Non-French speaking awardees are required to take French classes during their studies in France. Study Subject: Scholarships are awarded in all disciplines. Accommodation help and social and cultural activities guide. 50% off for Intensive French class at Alliance Française before departure. Eligible Countries: Scholarships are available to Hong Kong, Macau students and International Students. Not eligible: PhD students, short-term period stay (as trainees or summer courses) applicants, or a stay within an exchange program at a French institution. How to Apply: All applications should be sent at this email address sciences-at-consulfrance-hongkong.org. Labels: Europe Scholarships, France Scholarships, Master's Scholarship, Scholarship.